Why does Pujols regress to the mean? This is a followup both to my article on regression to the mean and David’s article on true talent. It seems to me that the best estimate of future OBP is past OBP, based on all the available data. So, in my little calculation, I simply recalculated OBP, initially based on the first 5800 and updated to include the next 100 PA. 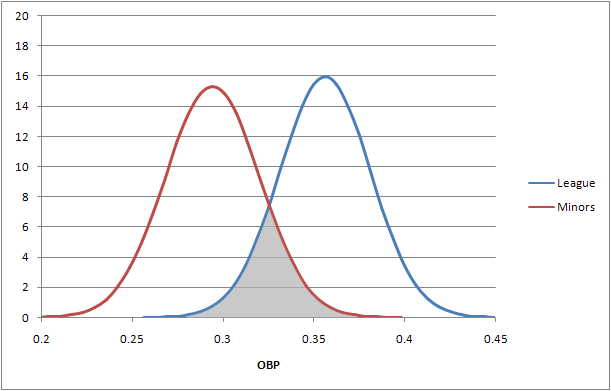 It seems to me that the resulting OBP, 0.424, is the best estimate we have of OBP going forward. That is, in the next N PA, our best estimate is the the batter will get on base 0.424N times. So I ask again, where have I gone wrong? The way you approach the problem seems to be with Bayesian statistics. You draw a player from the distribution of all major league players and start with the “belief” that he is average (which of course is totally reasonable). Then you use the information you gather over time to update your belief about the player. However, if your initial belief were different (for example, that Ichiro is not like anything that has every played in the majors and hence you have no initial prior or that he is the second coming of Ted Williams) you would get a different conclusion. The importance of the initial belief decreases over time, as you nicely describe above, but it never goes away. Neither of them are wrong. But it does bring up something worth noting. I am, in fact, using a “shortcut” proposed by Andy Dolphin in the appendix to The Book. I cannot explain these things as well as Andy can, so please, if you are interested in the subject, I would highly advise reading the appendix. I am also ignoring the fact that more recent plate appearances are more predictive than less recent plate appearances, as that’s a seperate topic and that would make the calculations much more confusing: the point here isn’t so much to project Pujols as it is to illustrate a point about how we would project Pujols. To go back to the original comment, yes, our best estimate of a player’s future performance is his past performance (while taking into account other factors such as aging that we are again ignoring for simplicities sake). There are two components to our estimate: what we think he will do going forward and our uncertainty about our forecast. In the case of Pujols, we would estimate his OBP going forward as .424, with an uncertainty (expressed in standard deviation) of .006. In other words, about 68 percent of the time, Pujols’ OBP should be between .418 and .430. Pujols is such an extremely good hitter that we’re extremely unlikely to see an ordinary MLB hitter put up those kinds of numbers; he’s about 2.75 standard deviations away from the league mean. 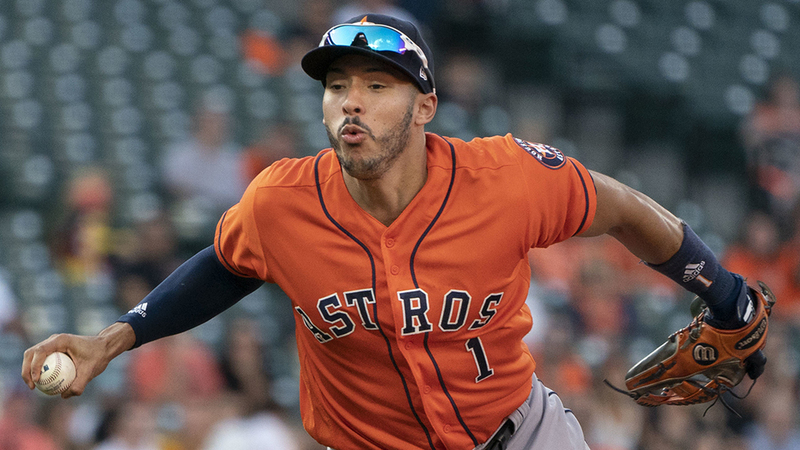 The odds are somewhat less than two percent for a typical hitter to put up that high of an OBP in about 310 plate appearances. 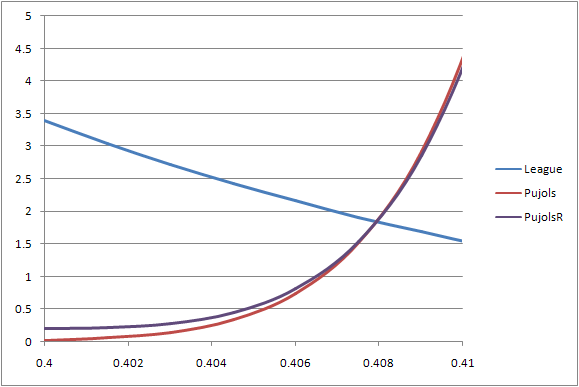 The regressed probability curve doesn’t quite hit zero the way the unregressed curve does. It’s a very slight effect, to be sure, but the tail continues on further to the left than the unregressed curve. And so while the mode doesn’t change, the mean certainly does shift very slightly to the left, by about four points. And that’s all that we mean when we say hitters like Pujols (or Chipper Jones, or whoever you want to use) regresses to the mean. While his performance to date is our best estimate of what he will do, if we are being asked to pick the single most likely outcome, we need to regress to the mean to find the outcome that best reflects the probability of all of the potential outcomes. Now this is the point where Pujols passes out of our tale, and we move on to considering the applications towards the other end of the scale. Remember at the start, when we said that we were assuming a normal distribution? 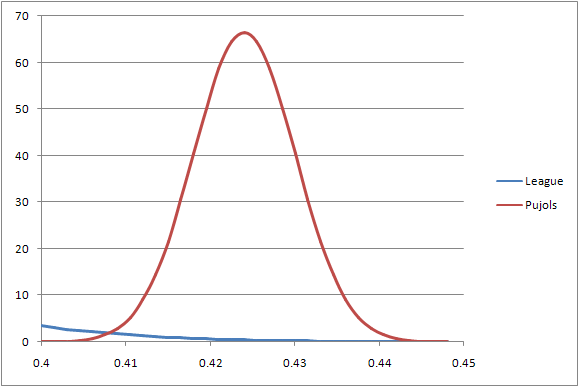 This is what’s referred to as a bimodal distribution, or a distribution with two distinct modes. Typically this happens when two normal distributions end up mixing together. 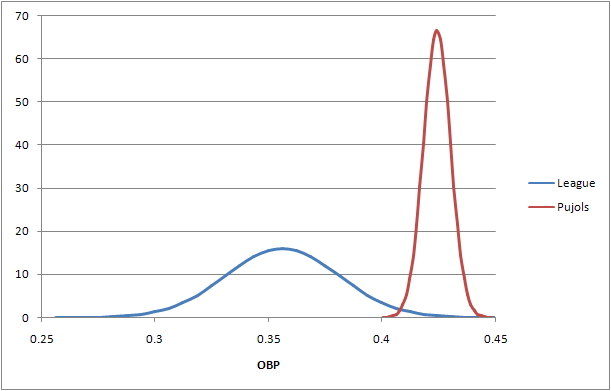 The red distribution is based upon the spread of OBP talent in Triple-A, using the regular Davenport Translations for 2008, in other words an estimate of what those players would have done had they been playing in the major leagues. The average translated OBP for Triple-A players last year was .294, or 62 points of OBP away from the major league mean of .356. The standard deviation for each distribution is pretty close to the same, given the same number of plate appearances: .026 for the minors and .025 for the majors in 310 plate appearances. That means that players halfway between the two are just a shade over one standard deviation from both means. The gray-shaded area represents the area that can be easily represented by either mean. (As plate appearances decrease, the overlap goes up; as plate appearances increase, the overlap goes down.) And here’s the crux of the matter: over 310 plate appearances, there’s a slight but not unreasonable chance for an average minor-league hitter to put up a major-league average OBP (less than 2.5 SDs, or less than two percent of the time) and vice versa. That doesn’t sound like a whole lot, until you realize that t any given time there’s about 390 position players on major league rosters and a similar number of players on Triple-A rosters. And players frequently move between the leagues all the time, thus the mixing. So in a small enough sample of performance, we have to decide which mean we want to regress some players’ performance to the major league or minor league mean. So what do most projection systems do to determine what mean to regress to for players they are projecting? For the most part, projection systems will regress everyone to the major league mean, even guys who haven’t played a day above Double-A. Why? Because if that player does end up with any significant amount of playing time in the majors, they likely do belong to the population of major league players. In other words, you end up with more accurate projections that way. But what that doesn’t mean is that if, say, an older veteran player and a younger farmhand with no MLB experience have the same projection, that they have the same odds of reaching that projection. It’s the difference between having a dollar and having a chance at a dollar on a scratch-and-win card. But when projection systems are tested for accuracy, all the cards that don’t win are simply thrown out and ignored. Also, many thanks to Joe Arthur for turning me onto the idea of a bimodal distribution. Where did the .356 average OBA come from? It’s more like .330. Before commenting on the main issue of this thread, let me ask a simple question. How did you arrive at 0.006 as the 1-sigma uncertainty for Pujols? I always thought that for Gaussian statistics, the uncertainty is the square root of the mean value. My estimate is more like 0.0085. I get this by taking sqrt(OB)/PA. With PA=5900 and OBP=0.424, then OB=2502, from which I get my result. are probably right. I was (incorrectly) extrapolating from my own experiences where the underlying distribution is binomial, but with p<<1, in which case the (1-q) term can be safely ignored. Thanks for correcting me. Oops…I meant the (1-p) term can be ignored (since it is essentially 1).